Background: Venous leg ulceration is a common and costly problem that is expected to worsen as the population ages. Current treatment is compression therapy; however, up to 50 % of ulcers remain unhealed after 2 years, and ulcer recurrence is common. New treatments are needed to address those wounds that are more challenging to heal. Targeting the inflammatory processes present in venous ulcers is a possible strategy. Limited evidence suggests that a daily dose of aspirin may be an effective adjunct to aid ulcer healing and reduce recurrence. The Aspirin in Venous Leg Ulcer study (ASPiVLU) will investigate whether 300-mg oral doses of aspirin improve time to healing. Methods/design: This randomised, double-blinded, multicentre, placebo-controlled, clinical trial will recruit participants with venous leg ulcers from community settings and hospital outpatient wound clinics across Australia. 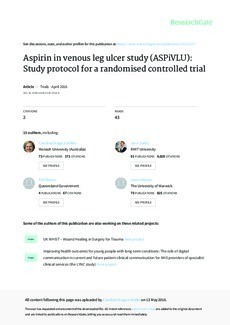 Two hundred sixty-eight participants with venous leg ulcers will be randomised to receive either aspirin or placebo, in addition to compression therapy, for 24 weeks. The primary outcome is time to healing within 12 weeks. Secondary outcomes are ulcer recurrence, wound pain, quality of life and wellbeing, adherence to study medication, adherence to compression therapy, serum inflammatory markers, hospitalisations, and adverse events at 24 weeks. Discussion: The ASPiVLU trial will investigate the efficacy and safety of aspirin as an adjunct to compression therapy to treat venous leg ulcers. Study completion is anticipated to occur in December 2018.